Tenmille Products are now one of the leading manufacturer of track for the garden model railway and one of the largest single manufacturer of products for Gauge 1, 16mm Narrow Gauge and G-Scale. Most items in this catalogue are manufactured by Tenmille and represents a continuously expanding range. During March 2000 we successfully negotiated to purchase the excellent range of Gauge 1, 10mm scale, etched locomotive and coach kits previously supplied by DJB engineering. These are now also available from Tenmille. In order to assist manufacturers and modelers the Gauge 1 Model Railway Association (GIMRA) and the Association of 16mm Narrow Gauge Modelers suggest well proven dimensional standards with which they suggest all modelers adhere too, all items manufactured by us are made to these standards. Tenmille Products was started in 1979 by Mr Roy Scott as part of Micro Mold Ltd who pioneered for many years molded parts for the model trade. As a result of his interest in model railways and frustration with slow progress on his own garden railway, due to the lack of commercial items. Mr Scott became convinced that more should be made available for this hobby. As a result the first Gauge 1 track system with a plastic injection molded sleeper base was launched. This new system which is available today and used by many Gauge 1 Modelers revolutionized track construction for the larger scales. Prior to this track construction required pinning individual lead cast rail chairs to wood sleepers. One yard length of track required around three hours construction time, therefore building a complete garden railway with perhaps several hundred yards of track required many hours of hard work. The track system is available with near scale bullhead brass or nickel silver rail along with the finely detailed sleeper molding. The combination of the two has produced the most authentic and attractive track systems available for Gauge 1. Soon after a 32mm gauge (0 gauge) track systems for 16mm Narrow Gauge and 0 gauge coarse scale modelers was introduced. Later still a 45mm gauge G-Scale system also followed along with a further Gauge 1 system using code 215 flat bottom rail. An important feature regarding the use of plastics outdoors relates to the problem of decay due to ultra violet rays from sunlight. Mr Scott was very concerned and aware of this problem as its effects were well known. As a result all Tenmille plastic track components incorporate U.V. stabilisers. This increases the life of plastic components outdoors and from knowledge Tenmille is the only manufacturer world wide to provide this protection. As a result Tenmille has built an excellent reputation for track and track components for the garden railway. Along with our track, track components and pointwork we also manufacture a large range of other items including locomotive kits, rolling stock kits and accessories including transfer sheets and wheels. We are also agents for Aster live steam Gauge 1 model locomotives. 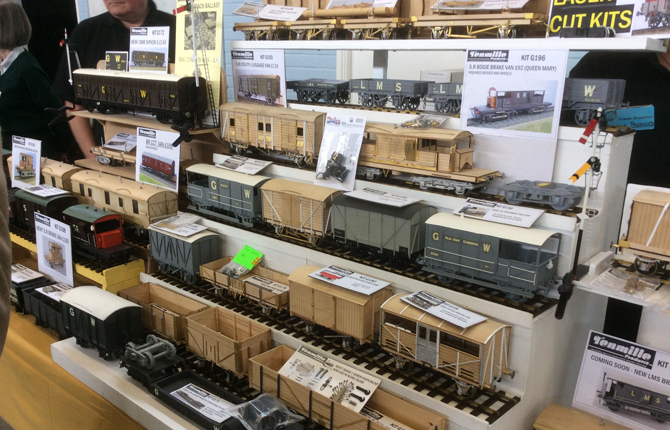 Tenmille Products is currently owned and operated as an enthusiastic family business, some members are also long standing modelers and model engineers. Bob Hines being part designer of the “Project” Gauge 1 locomotive design. Our aim is to offer an efficient, helpful and personal service to all of our valued customers.